Starting next month, ALK Technologies hopes to take iOS device owners in a new direction. At the Mobile World Congress in Barcelona over the weekend, the navigation software maker announced plans for a free route-planning and on-board mapping app that it expects to be available for the iPhone and iPad next month. CoPilot GPS will let users download maps onto their iOS device to use, even when they’re not connected to a network. The app will offer mapping capabilities, including millions of pre-installed points of interest, as well as route-planning capabilities. 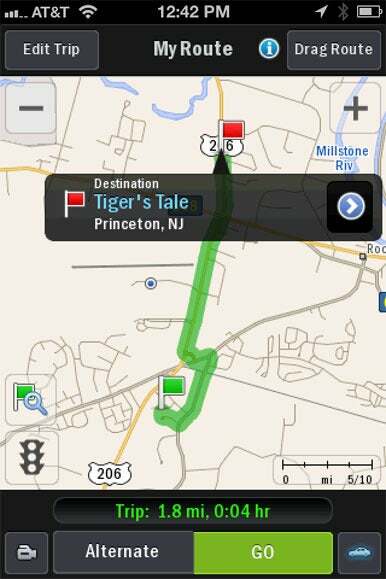 To that end, CoPilot GPS will deliver many of the same features found in ALK’s CoPilot Live North America, a $20 turn-by-turn GPS navigation app. Still, ALK sees the free CoPilot GPS not as a lite version of its paid app, but more of an alternative to Google’s Maps offering. 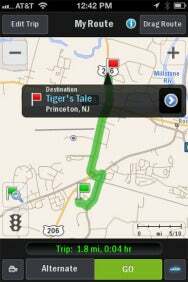 As with Google Maps, CoPilot GPS will let users enter in a destination; it calculates routes, offering directions, distance, and travel time. In fact, ALK’s app will provide up to three ways to reach a destination—users can drag the route on their iPhone or iPad screen to fine-tune the route by hand. ALK hopes to further distinguish CoPilot GPS with advanced multi-stop trip planning and optimization features. Users will be able to enter in up to 50 stops on a trip—CoPilot GPS will calculate the best route to hit all those stops. Other features slated for CoPilot GPS include support for Bing and Wikipedia to provide information about points of interest as well as real-time weather data. In addition, CoPilot GPS will offer Twitter and Facebook integration, allowing users to post status updates from within the navigation app. As a free app, CoPilot GPS won’t include some of the capabilities found in the more full-featured CoPilot apps. It won’t provide voice-guided turn-by-turn navigation or 3D mapping. The app also won’t dynamically recalculate your route, though users can tap "Recalculate" once off-route to get you back on track. ALK plans to make it possible to upgrade to voice-guided, turn-by-turn navigation via a $20 in-app purchase. It’s also offering the ActiveTraffic real-time traffic service as an in-app purchase for a $10-per-year subscription.